Indian Prime Minister Narendra Modi, who swept to power in May with a thumping electoral mandate, faces a major test in diplomacy in the form of bilateral summits this month with three powers central to Indian foreign policy — Japan, China, and the United States. Modi met with Japanese Prime Minister Shinzo Abe in Tokyo on September 1, and will now receive Chinese President Xi Jinping in New Delhi. He will then visit the White House at the end of the month. China poses the toughest challenge for Modi, although the Indian leader had a good meeting with Xi on the sidelines of the recent summit of BRICS, a grouping of major emerging economies. Their body language at the summit in Brazil indicated the two had formed an easy personal equation. After assuming office, Modi was quick to reach out to China, negating the assumption of some analysts that his government would be less accommodating toward Beijing than its predecessor. Modi views China, with its massive foreign-exchange reserves, as a potential partner in India’s development. Yet, at a time when the China-India trade relationship is already lopsided, with Beijing exporting three times as much as it imports and treating India as a raw-material appendage of its economy like Africa, Modi must find ways to address this glaring asymmetry while seeking to make a cash-rich China an important partner in India’s developmental priorities. Another challenge for Modi is to balance such deeper economic engagement with India’s strategic imperatives, including bolstering defenses against China and containing increasing Chinese border provocations. According to figures released by Minister of State for Home Affairs Kiren Rijiju in India’s Parliament recently, Chinese border transgressions this year have exceeded more than one per day, totaling 334 up to August 4. The often tense relationship between the world’s two most-populous countries holds significant implications for international security and Asian power dynamics. As China and India gain economic heft, they are drawing ever more international attention. However, their underlying strategic dissonance and rivalry over issues extending from land and water to geopolitical influence usually attracts less notice. The vast Tibetan plateau separated the Indian and Chinese civilizations throughout history, limiting their interaction to sporadic cultural and religious contacts, with political relations absent. It was only after Tibet’s annexation in the early 1950s that Han Chinese military units appeared for the first time on India’s Himalayan frontiers. This was followed by a bloody Himalayan war in 1962. More than half a century later, their old rifts persist even as new issues have started roiling their relationship, including Beijing’s resurrected claim since 2006 to the sprawling northeastern Indian state of Arunachal Pradesh, almost three times larger than Taiwan. A perceptible hardening of China’s stance toward India is also manifest from other developments, including Chinese strategic projects and military presence in the Pakistan-held portion of Kashmir. Between 2000 and 2010, China-India trade rose 20-fold, making it the only area where relations have thrived. Yet the booming trade has failed to subdue their rivalry. At the root of the current Himalayan tensions are China’s persistent efforts to alter the territorial status quo. To be sure, India is not China’s only target: The People’s Liberation Army (PLA) is seeking to also disturb the territorial status quo with several other neighboring countries, including Japan, the Philippines, and Vietnam. Instead of invading, the PLA has chosen to engage in a steady progression of steps to outwit opponents and create new facts on the ground, whether in the South China Sea or the Indian Himalayas. In this way, it has sought to change the status quo without inviting outright conflict with neighboring countries. While China’s navy and a part of its air force focus on supporting revanchist territorial and maritime claims in the South and East China seas, its army has been active in the mountainous borderlands with India. To prevent the PLA from further nibbling at its territories, India has been beefing up its military deployments in the two sensitive regions located on the opposite ends of the Himalayas — Ladakh and Arunachal Pradesh. It has also launched a crash program to improve its logistical capabilities through new roads, airstrips, and advanced landing stations along the Himalayas. More importantly, India is raising a new mountain strike corps to arm itself with quick-reaction ground offensive capabilities against China. This new XVII Corps, with more than 90,000 troops, will cost $10.7 billion and be fully operational within five years. India has already deployed ballistic missile squadrons, spy drones, and Russian-built Sukhoi-30MKI fighterjets in the eastern theater against China. Still, with the inhospitable Himalayan border difficult to patrol effectively, incursions by PLA troops have increased across the “line of actual control” (LAC) that China itself unilaterally drew when it defeated India in the 1962 Chinese-initiated war. Because the LAC has not been mutually clarified — China reneged on a 2001 promise to exchange maps with India — Beijing disputes each intrusion, claiming its troops are merely on “Chinese land.” To be sure, when challenged by Indian border police, the intruding troops tend to retreat from most points. But the rising pattern of incursions ties down large numbers of Indian border police and army troops along the Himalayas. Despite China’s belligerence, Modi has gone out of his way to befriend Xi’s government. As prime minister, he received the Chinese foreign minister before welcoming any other foreign dignitary. Modi’s first bilateral meeting with a major state head was with Xi in Brazil. He allowed Xi to advance his India visit to September while postponing his own Japan trip so as to meet with Xi first in Brazil. 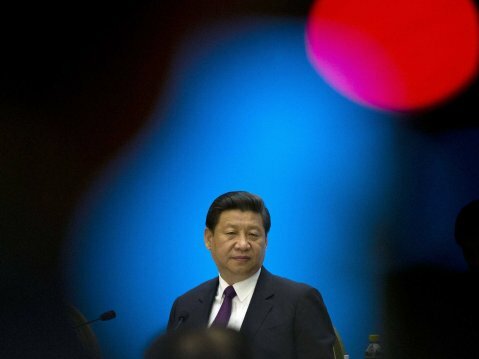 Xi will be the first leader of a major power to travel to New Delhi for talks with Modi. Modi sent India’s vice president to the 60th-anniversary celebrations in Beijing of the Panchsheel (Five Principles) treaty of peaceful coexistence, a pact that China used to outfox and outflank India, culminating in the 1962 border war. Modi even agreed to let Shanghai be the headquarters of the new BRICS bank, accepting just a consolation prize for India — an Indian as its first president. These overtures, however, can barely conceal either India’s anxiety over China’s increasing muscle flexing or Modi’s determination to build close strategic ties with Japan in order to put discreet checks on China’s exercise of its rapidly accumulating power, which risks sliding into arrogance. China’s strategy of constant outward pressure on its borders not only threatens to destabilize Asia’s status quo but is also pushing countries like India, Japan, and Vietnam to strategically collaborate. Modi’s priority is to ensure stable power equilibrium in Asia. Brahma Chellaney is a professor of strategic studies at the independent Center for Policy Research in New Delhi and the author, most recently, of “Water, Peace, and War” (Rowman & Littlefield, 2014).